Markets Boom but Will Elections and Gas Field Moves Hit the Region's Outlook? 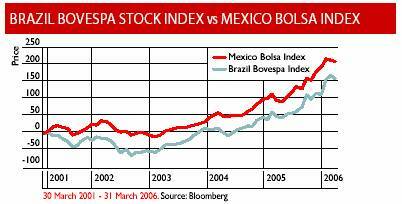 Latin America as a region has profited from commodities’ apparently relentless bull-run. However, managers have noted much of the region stands at the brink of potential transition, as a slew of elections take place during 2006. Will Landers, fund manager of Merrill Lynch Investment Managers’ (MLIM) Latin American Fund, focused on equities, believes elections scheduled for Mexico in July and Brazil in October will have no negative impact on those countries. In Brazil, the Left’s candidate, incumbent Luiz Inacio Lula da Silva, has presided over a period of growth and prosperity, and will not frighten investors, Landers says. Da Silva’s main opponent, Geraldo Alckmin, the PSDP candidate of the Right and currently governor of Sao Paulo, would be, if anything, more pro-business than Lula, he says. In Chile, the new government will demonstrate similar policies to the previous one, which had also presided over a strong economic situation, with no reason to seek change. Even in Mexico, where a left-wing candidate is running in the forthcoming election, and who may cause concern among investors, Landers says he does not expect significant danger to the economy. He says there is “no room for Andres Manual Lopez Obrador of the Party of the Democratic Revolution) to mess things up,” due to the political gridlock” that has built up in the country. 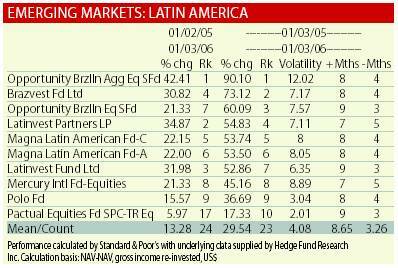 However, Andres Azicri, fund manager of the Argentina-based Cima Aconcagua Fund, is more nervous about the elections. “We are optimistic about Latin America over the next six months. However, we expect risk to increase during the second half of 2006 as election processes take place in large countries like Brazil and Mexico,” he says. “The political cycle is moving away from conservative and market-friendly policies. Although most governments have strong capacity to pay debts, doubts about their willingness to pay during eventual not-so-great times are growing,” he adds. While many long-only managers have enjoyed the sustained growth brought about by improved fundamentals in the region and strong commodities, he says funds such as Copernico will thrive in the conditions the elections will create. Although Maxit admits there is a greater risk in such situations he feels in some instances the prices make it a risk worth taking. “It’s just a matter of finding a few small, good investments and sitting on them for a while,” he says. Landers says the Merrill Lynch fund invests 94% of its assets in Brazil, Mexico and Chile, the only countries he deems to have sufficient size and liquidity for investment. Maxit invests approximately 80% Copernico’s fund assets in the same three countries, along with Argentina, where the fund is based. Landers describes Argentina’s market as too expensive and its government as too populist. Maxit says it is very important in Latin America to have a local presence, especially when trading in small- and medium-sized, and often, illiquid deals. Copernico is focused on smaller deals and has recently opened an office in Sao Paulo to gain better access to Brazilian situations. “We invest in these countries as a local investor,” he notes. In this way, the fund avoids competing with funds trading in the region from London and New York. MBA Asset Management, an Argentine bank soon to launch its second regional hedge fund, the Latin America Opportunity Fund, in the UK jointly with Emergent Asset Management, stresses the region remains relatively sparsely populated by hedge funds. This, says MBA AM, is noteworthy against a backdrop of several years of strong economic growth, twin surpluses and flexible exchange rates. MBA AM says there is currently US$24 billion in offshore and onshore hedge funds operating in the region, accounting for just 2% of the global hedge fund industry. However, Copernico’s Maxit notes the tide has already started to turn. “The market has become more crowded. I won’t say it is totally congested today, but there is a lot more traffic than there used to be.” Nevertheless, Copernico still chooses to avoid the trades likely to attract the attention of the region’s biggest investors. These positions are offset by a short position in a blend of US$-denominated, long-duration sovereign bonds from Brazil, Mexico, Jamaica, Peru and Uruguay. “The dollar amount of this short almost equals the size of the long equities portfolio, however, it is much less volatile,” Azicri says. In February, Aconcagua was up about 3%, and 6.7% in 2006, to the end of January. Both MLIM and Copernico have the largest portion of their assets in Brazil, South America’s largest economy. MLIM’s fund has 60% invested there. Landers says he was heartened by the economy’s resilience in the face of recent scandals that have rocked Brazil’s political scene. While Brazil is being driven by commodities demand, especially from China, he says domestic consumption will drive growth over 2006’s second half Standard and Poor’s has upgraded Brazil to BB – Landers believes it will be investment grade by 2008. He notes Brazilian pension schemes are well funded, and while largely invested in bonds, they are in a position to meet their liabilities with these low-risk investments. Brazil is self-sufficient in oil and has the most dynamic export base in Latin America, Landers says, with only 20% of its exports destined for the US, leaving it less exposed to America’s fortunes. Despite Copernico being based in Argentina, the country is the smallest recipient of investment from the fund. Brazil has the largest allocation, though it is capped at 40%, followed by Mexico. Conversely, Argentina provided 70% of Aconcagua’s performance in February, with Venezuela and Brazil the second- and third-largest contributors respectively. MBA Asset Management’s Patagonia Argentine Recovery Fund (again, available through Emergent) is an event-driven fund focusing exclusively on Argentina. It says it has delivered 53.56% since October 2003, investing across many asset classes. Predominantly it focuses on mergers, restructurings and leveraged buy-outs, relative-value trades, long and short equity trades and local markets. Mexico’s economy is dominated by gold, and its prospects are closely associated with the fate of the precious metal, as well as oil and by the US economy. Landers says Mexico is close to fair value, and therefore offers few equity buying opportunities. MLIM is underweight the country, although Landers predicts there could be a significant move in the future, possibly in reaction to the election, that could create a good buying opportunity. Prospects are good there in the home-building sector, Landers says. Government-funded mortgages have recently been made available, creating a housing boom for the middle class. He notes the initiative is likely to remain for the foreseeable future, as “all politicians like home ownership.” He says equities in this sector currently trade at a discount to what Landers sees as fair value. While Mexico is gold, Chile’s metal is copper, providing a slice worth more than 40% of the country’s exports, while 70% of its GDP is copper-related. 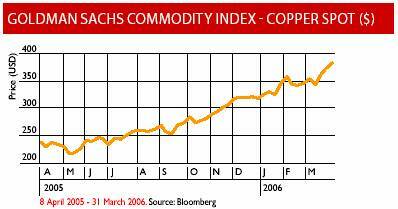 The copper price has shot up recently and Landers expects the trend to continue. Consequently, Chile’s economic growth prospects look good, he says. The prospects for Chile’s pensions are even rosier than those of Brazil, Landers notes: “Chile has the most-developed pension fund system in the region and one of the best in the world.” Despite this, MLIM is underweight Chilean equity; Landers believes they are over-valued, while liquidity is a concern. In addition, no copper manufacturers are listed in Chile, making equity access impossible. Landers says the best way to gain exposure to the copper market in Chile is to invest in the equities of manufacturers of copper consumer goods. He says he expects to increase exposure to Argentine equity as he decreases exposure to its fixed income securities. Although commodities are important to the region and dominate its fundamentals, Maxit says much more is going on in Latin America. He notes telecoms, media and entertainment, infrastructure, housing and public works as areas driving the region. Copernico has a near-seven-year track record of positive results, spanning the Argentine sovereign default in 2001 and the Brazilian real devaluation of 1999, as well as times when the commodity markets were very low. “No matter what the environment is, there are always opportunities around,” Maxit says. Copernico has a number of strategies in which it specialises, providing a diversified revenue stream. It does not tend to move dramatically between them, preferring moderate adjustments of its positions to capture trends. Copernico currently has positions in Argentina and Brazil, in the latter betting on interest rates falling, being long fixed-rate bonds. In Argentina, the bet is on the appreciation of the currency. With inflation picking up in Argentina and the value of the peso stable, Maxit is long inflation-linked bonds denominated in pesos. Today, it is also involved in lending via instruments such as mortgage-backed securities. “There is a tremendous shortage of lending in the region,” he says, with second- and third-tier companies largely under-served. Copernico has active plays in event-driven, M&A activity, especially in Brazil and Mexico, using the countries’ fixed-income markets. This article first appeared in the May 2006 issue of Hedge Funds Review.